Believe it or not Evansville Community Theatre is still alive. We have taken a couple of summers off but we’ve been itching to get something, anything, going. So in an effort to relaunch we are pleased to announce auditions for the fall radio production of Frankenstein. Just because we haven’t done a play for a while doesn’t mean the Board hasn’t been busy – we’ve been looking at our organization and deciding how to best move forward. 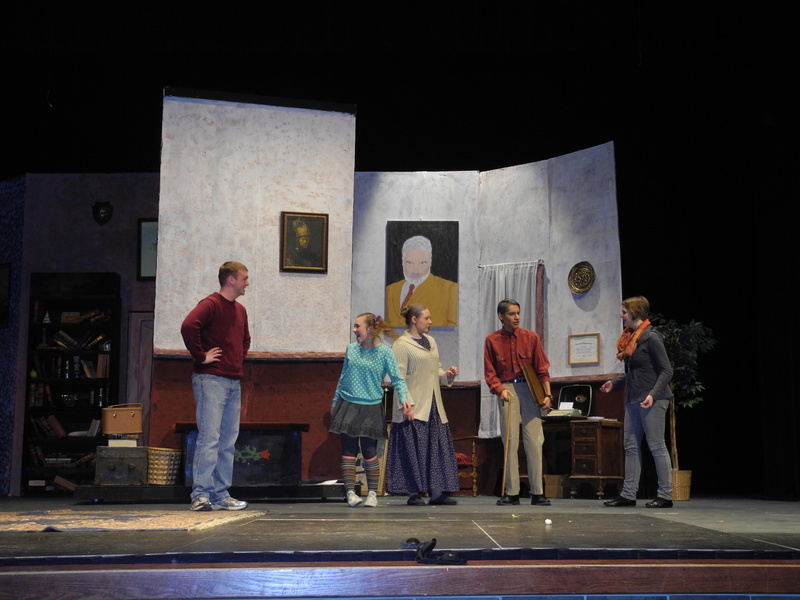 With any small community theatre it’s a struggle–a balance of having enough volunteers and money to produce a show. When we have a production in process the people naturally come to help out, but they soon drift away after the production is over. We have looked at the organization from all angles over the last several months and continue to develop our ideas and mission and just how we fit in this community. The journey has been exciting, scary, and daunting but we keep at it because we feel that theatre plays an important role and adds another dimension to our growing community. Over the next several weeks we will be letting you know about our progress, about our new home, about our revamped organization. And if you want to get involved now–be part of our planning, throw out new ideas, and help promote our group–drop us a message on Facebook or e-mail. We are looking for you! If you want to audition for our radio production of Frankenstein check out our Auditions page at etctheater.com. Sign Language Interpreted Show Friday, July 18! It’s been a long week of rehearsals, refining the rough spots, finishing the costumes and props, painting and decorating the set, setting lights, checking the sound. 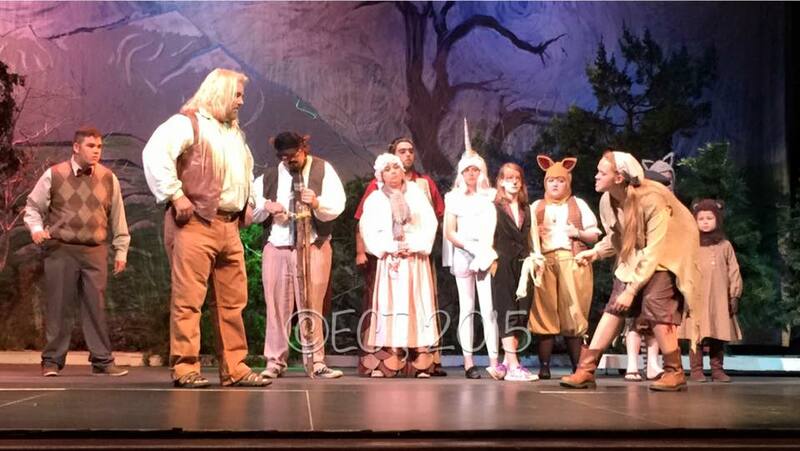 We’ve done all we can do and now it’s time to finally share ECT’s production of The Lion, The Witch, and The Wardrobe. Since early May, the cast has been working toward tonight–finding their character, memorizing their lines, understanding where they needed to go an when. 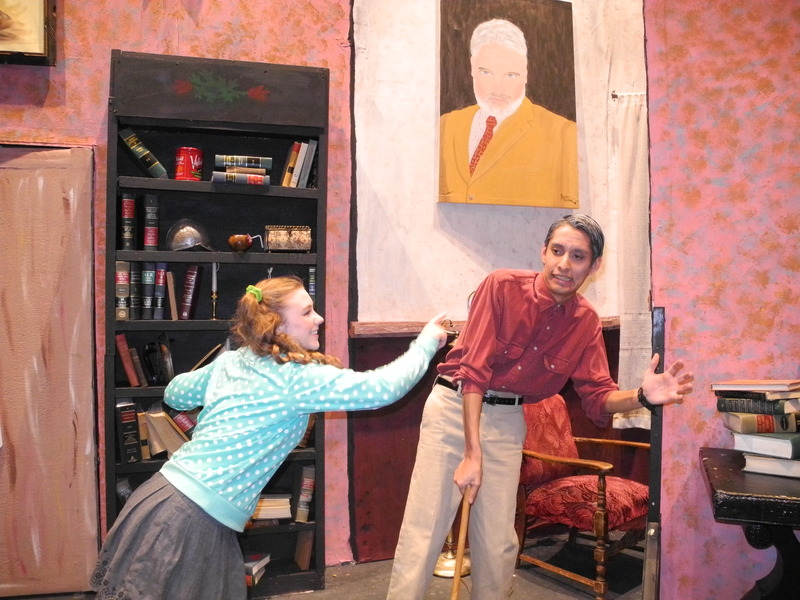 The set was built, the costumes were begged, borrowed, and sewn, the backdrop was painted. 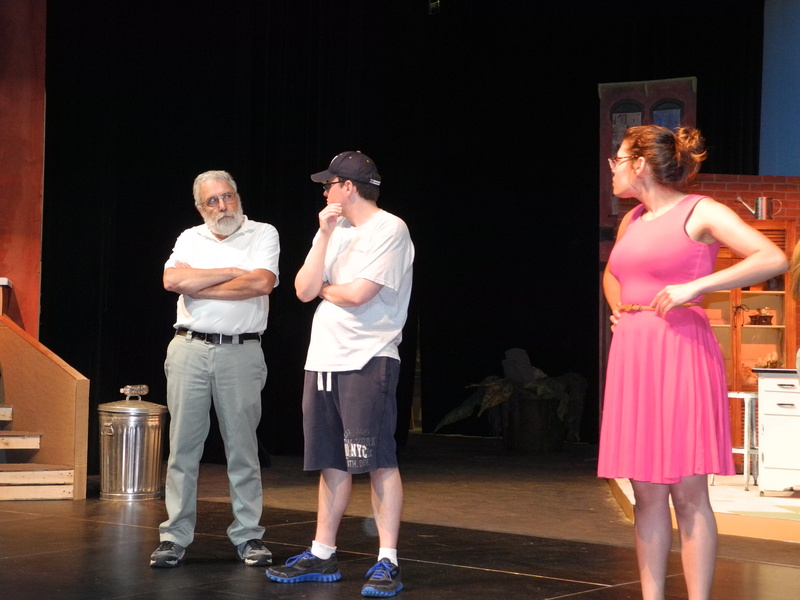 Each night, with the performances well on the horizon, the cast directed by Dave, and the crew, under the watchful eye of Melissa, worked with this weekend in mind. We did this all in the hopes that people will come and see the show. So come see a beautiful and engaging production of The Lion, The Witch, and The Wardrobe this weekend. Come audition for The Lion, the Witch, and the Wardrobe. Auditions are for adult roles and children 8 and up. Rehearsal Schedule: Rehearsals start in May and will be weekday evenings, some Saturdays may be required as we get closer to the production. Check out the Auditions page at ectstagelignt for more information and sides to prepare. 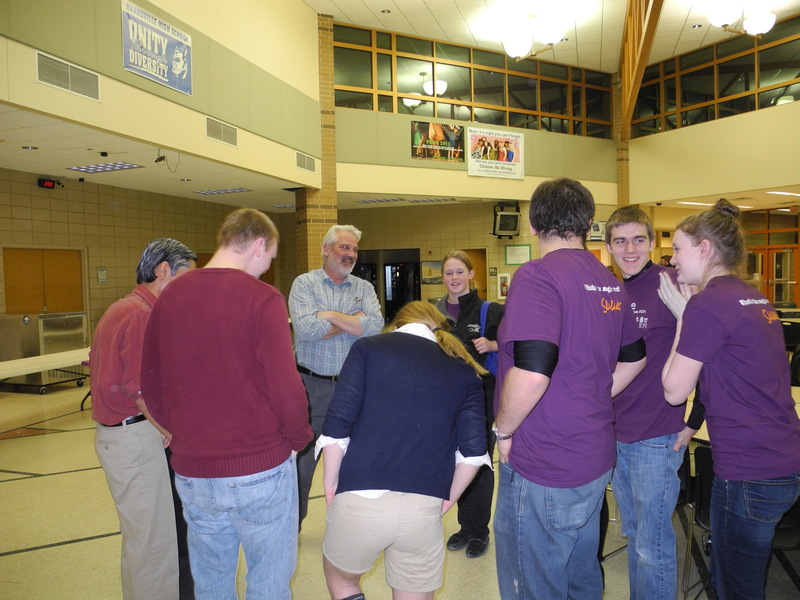 Once the production shifts from the middle school rehearsal space to the high school there is a sudden shift in the momentum. The crew has been patiently waiting to get into the workshop to start building and painting and the cast is anxious to work on the stage. 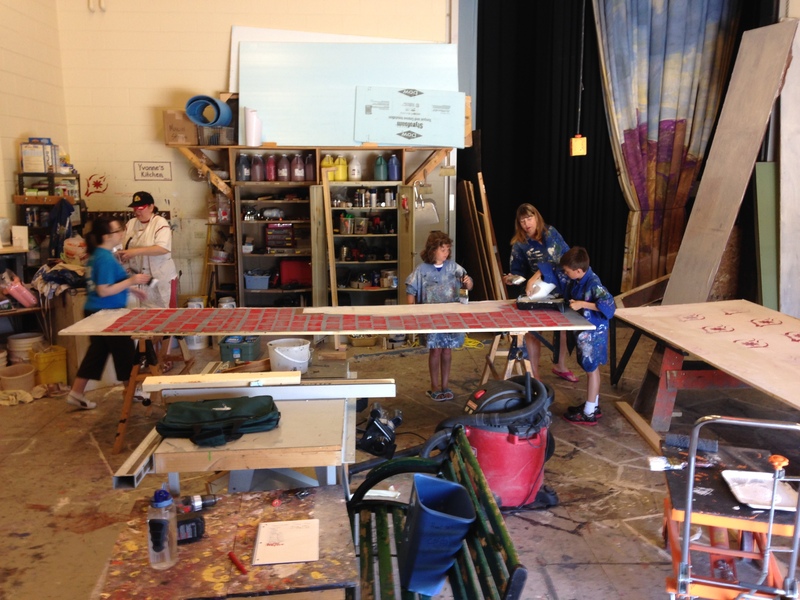 There’s Saturday workdays and everyone, actors included, shows up to build or paint or help with props. On rehearsal nights, the actors are working on stage while the crew continues in the shop. 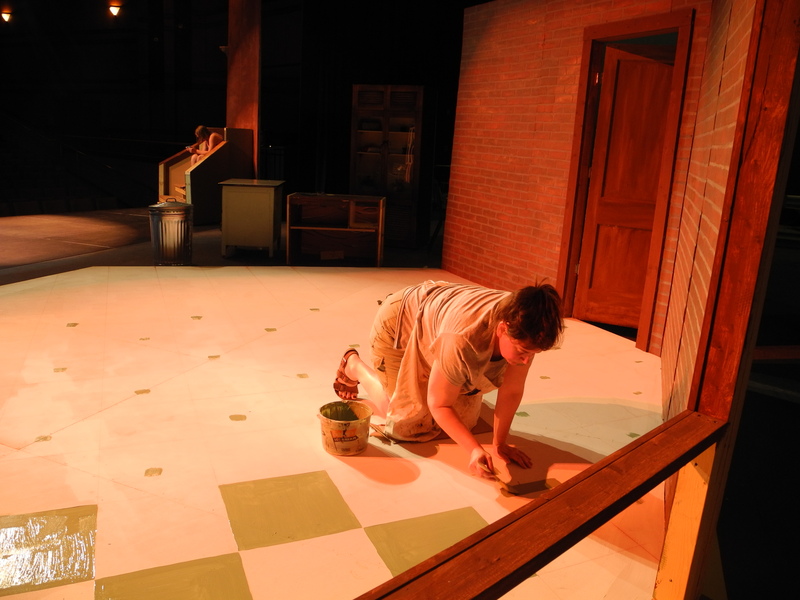 At some point the paths of both intersect and some of the actors that aren’t on stage pick up a paint brush to fill in the down time while the crew is building on stage among the actors. 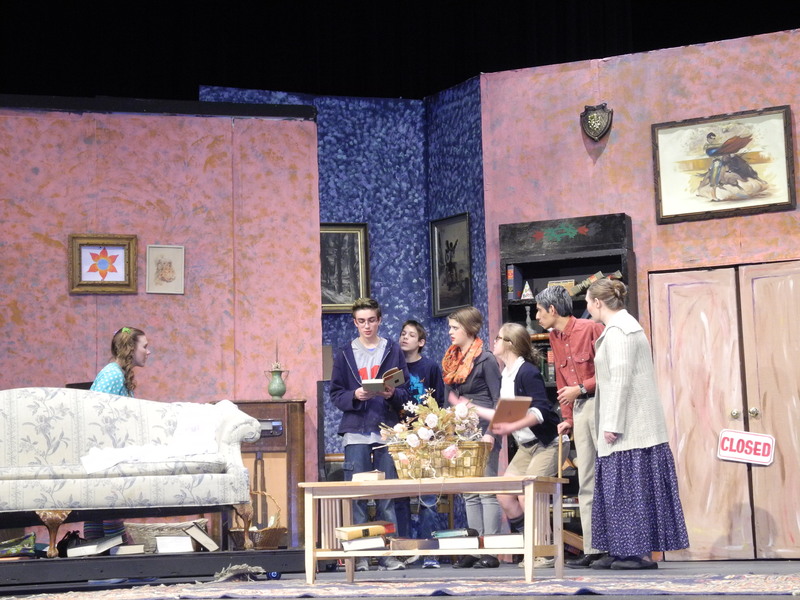 And then, in the final week before tech week, the suction of the play is so great that everyone involved is moving from their work, to the theater, to home to get some sleep, and back to work again. The actors start arriving earlier then the scheduled rehearsal so they can work together on the rough parts of songs or scenes. The choreographer is working with everyone on dance steps, and, from time to time, an actor will appear on stage in a costume for the directors to review. The pit band and the sound board operator arrive and the light designer is working in the afternoon when the theater is empty and darkness isn’t an issue. The producer even had a meeting with the Front of House Manager, to finalize what is needed there. Today is kind of a de facto day off for everyone but a large group was at the school early in the morning converting a trailer to a float for the 4th of July parade. 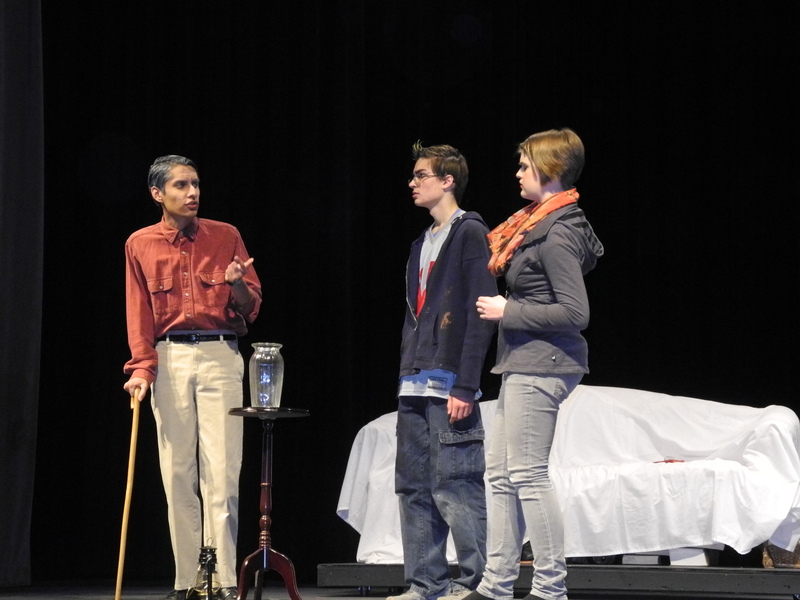 Mushnik, Seymour, and Audrey rehearse. The vortex has come to full rotation and everyone who is involved is sucked in. 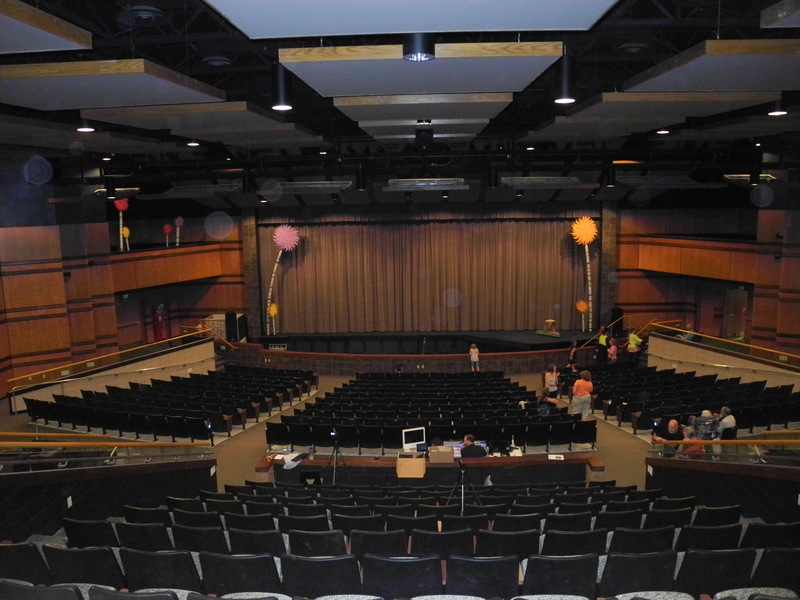 When you go into the theater it is filled with energy, activity, and the sense that in a week the curtain will open. Will we be ready? Like to sing? Like to dance? Like to entertain an audience? Come to Evansville’s J.C. McKenna Middle School on Saturday between 10 and 2 or Monday evening from 6 to 8 and audition for ECT’s Little Shop of Horrors. So what should you do? First prepare 16 bars of your favorite show tune and make sure you bring the piano music along. Some excerpts from the play as well as some forms that you will need to fill out are available on the Audition page on our website, the Eager Free Public Library, or will be available at auditions. You don’t need to prepare a monologue but Melissa the Director and Co-Director Dave will have you do some dialogues from those excerpts. Once you get to the Middle School, come in the front doors on First Street. We will have greeters waiting for you and will show you to the cafeteria where you will stop to get your picture taken. If you haven’t filled out the forms you will need to do that first, then once Melissa is ready, we will take you into the auditorium. There you will let your song rip, do some dialogues, talk to crew and then you’re on your way. The only requirements are that you are high school age or older and be available for most rehearsals during May and June and all rehearsals and performances in July. 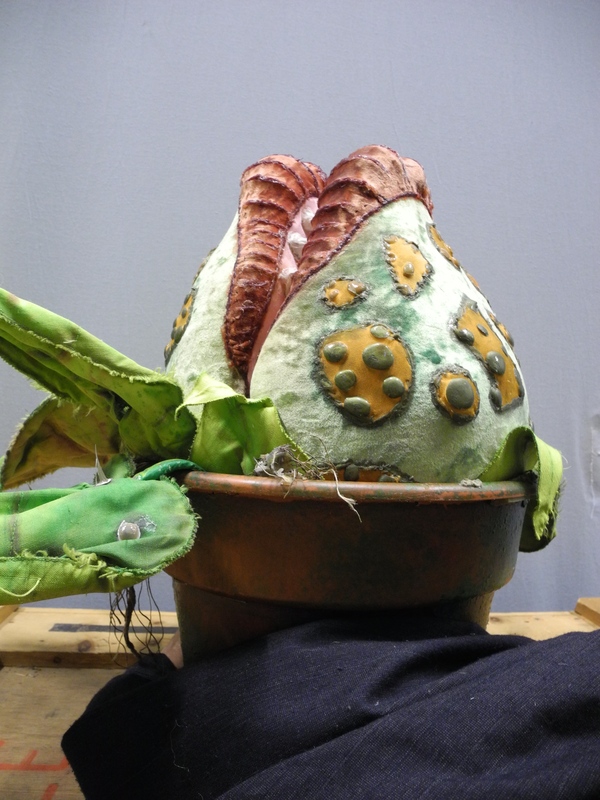 One of the challenges of this play is that we will be renting Audrey II and we won’t be able to get her until the weekend before our final week of rehearsals. Little Shop has a small cast but we are always looking for new faces. So if you always wanted to try acting or you’ve acted in lots of plays come audition! Imagine waking up in an old house with eight other strangers with no clue as to who you are, where you’re at, and no way out! 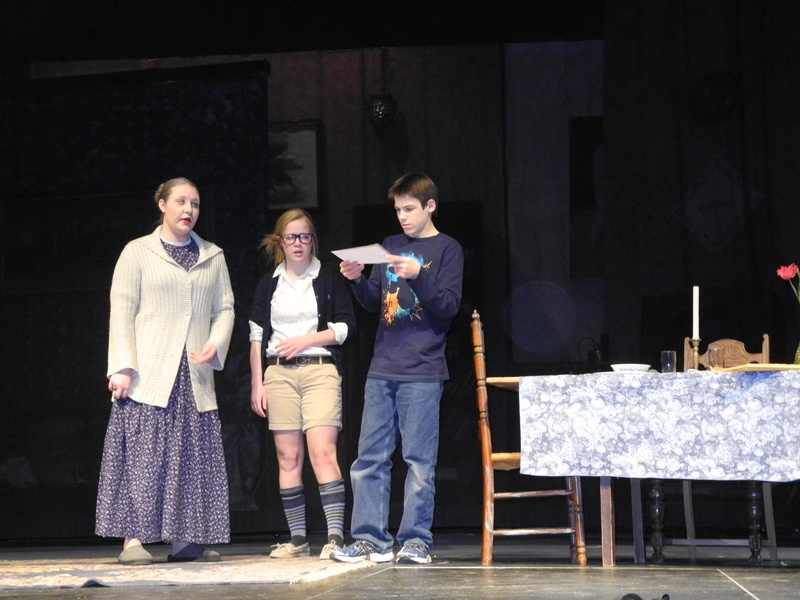 That’s the premise of No Clue, Evansville High School’s student production. 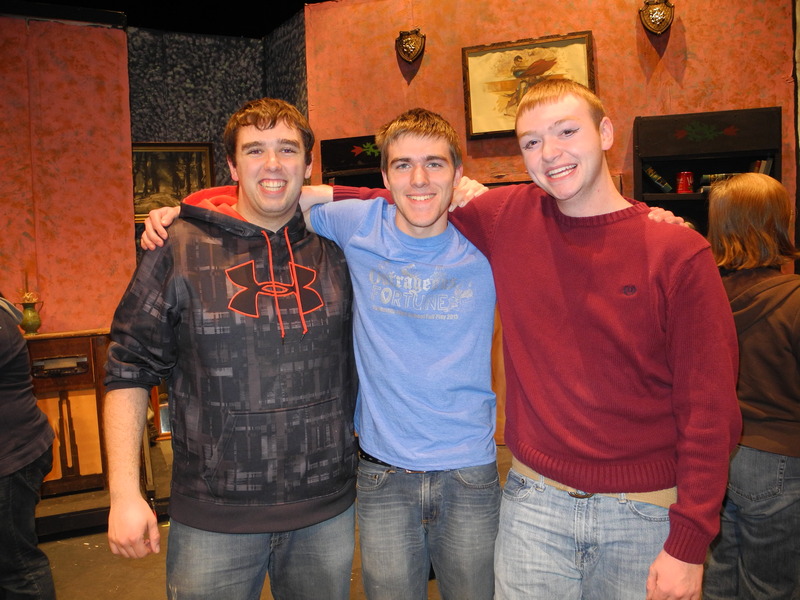 This fun comedy was written by EHS Seniors Jake Schroeder, Erik Nelson, and Clark Cybart-Fuson. 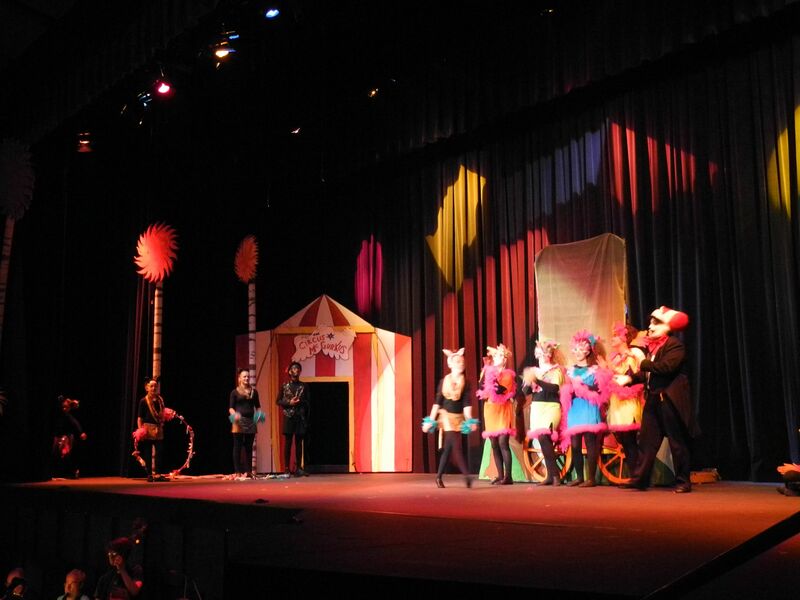 The annual student production is produced, directed, and managed entirely by EHS students. That’s reason enough to go see it tonight at 7:30 pm and tomorrow at 2. It’s well done and the efforts of all those involved show in this excellent production. 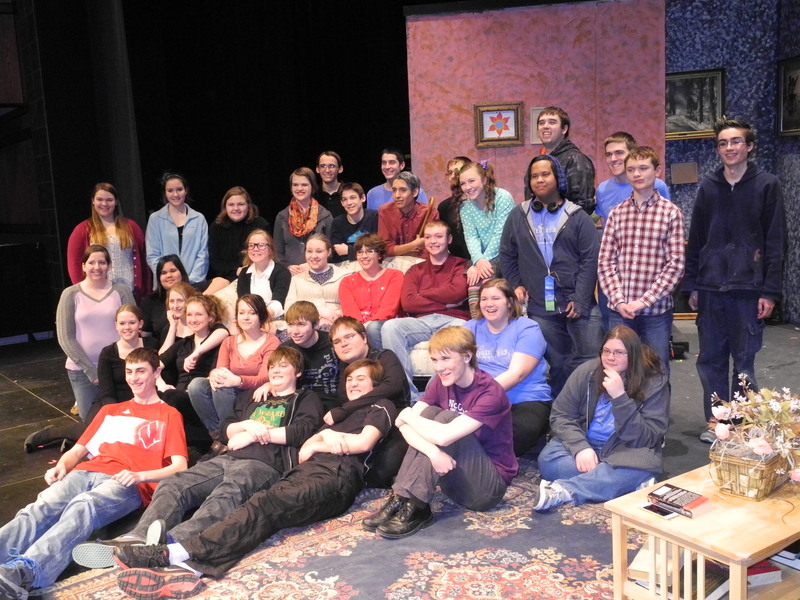 The student cast and crew of No Clue. Reset your browser as Evansville Community Theatre’s web address has changed to ecttheater.com. Through all fault of my own since I serve as website minder as well as blogger, the old website domain lapsed and it was snatched up by some business interest we would rather not acknowledge. Web domains, or the buying and selling of them, is a business and while I should have been paying attention, it was snatched out from under us. Lesson learned. We have no intention of buying it back. In fact, the address was long, cumbersome, and easily misspelled so it was a chance for us to fix all three of those issues. So check out ecttheater.com. WHO KNOWS, THERE MIGHT BE AN ANNOUNCEMENT ABOUT A SUMMER PLAY THERE. 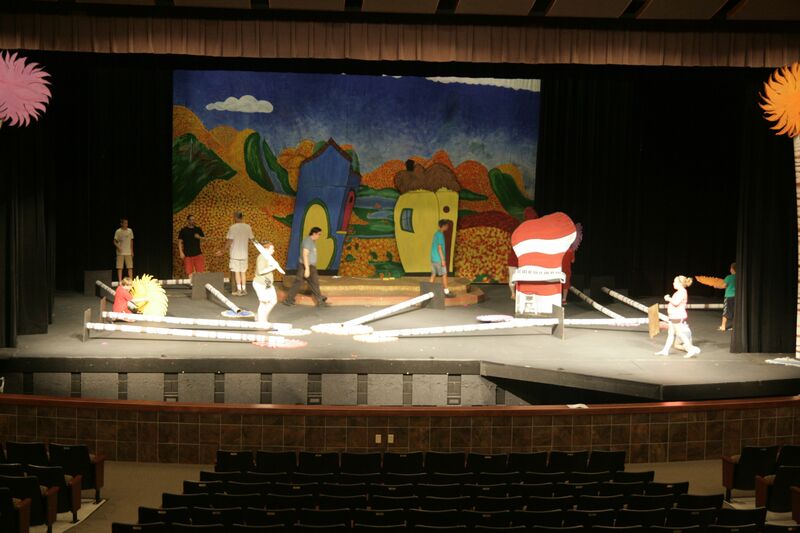 Usually when a play is over, the tech crew is ready to pack it all up and go home. It seems like in most musicals there is one slow song that goes on too long, a scene that is ho-hum at best, or some other aspect that in combination with everything else burns out the crew. But not with Seussical. We were in agreement that we could have run the show a few more weekends. We were all surprised. When we first looked at the script, it was all singing and dancing with little dialogue. We had second thoughts on the idea but when the spot light hit JoJo and the Cat in the Hat appeared it was obvious that it would be a great show. One audience member had said she was too old to have read Dr. Seuss and didn’t know much about him. After the first act she reported that she didn’t really know what was going on but she loved the singing and dancing and it was way more than she expected from community theater. 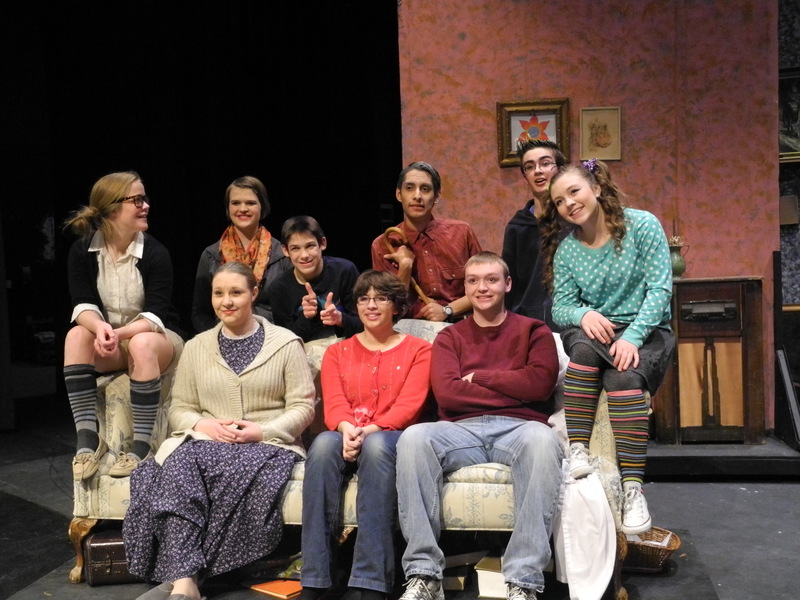 Of course credit goes to everyone involved and the audiences who showed up and rose to their feet when it was over. Director Christa brought a vision to the show that was colorful, fun, and allowed the actors and crew to shine. The crew and actors went over the top in a show that allows for that. But just like that it’s over. 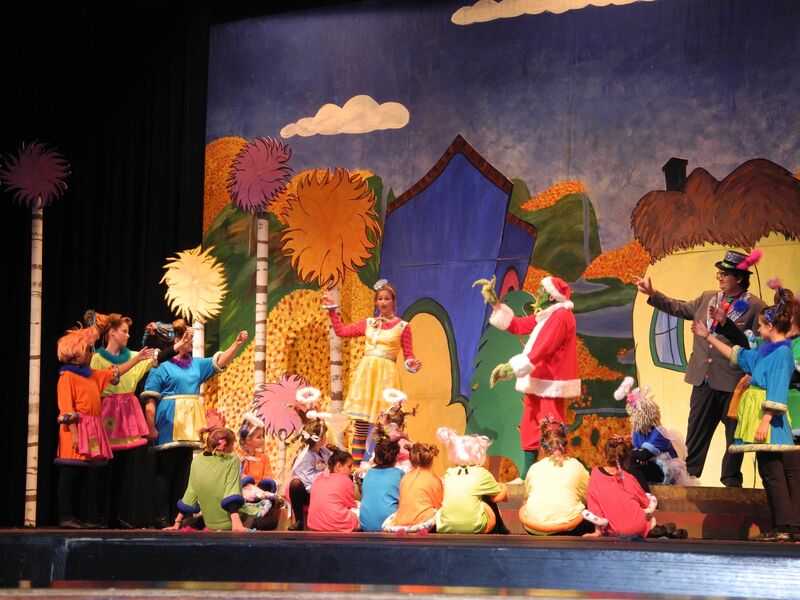 The truffula trees and Whoville are gone, the shop cleaned, the stage mopped and the cast party is over. So, as the actors always want to know, what’s next? Julie, the Music Director leads the singing. 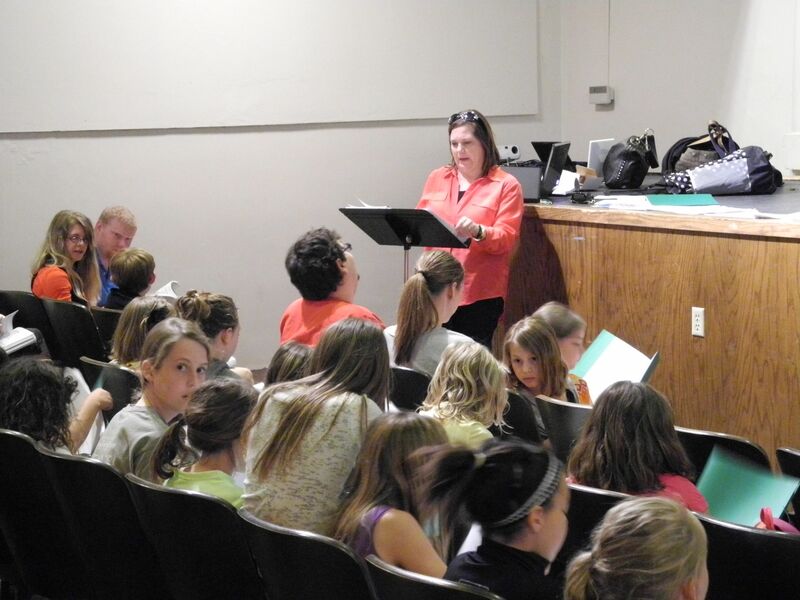 For the last three weeks, hidden away in the Middle School auditorium, the 50 plus members of the cast of Seussical have been rehearsing. The first few weeks are unsettled and by the time we transition to the high school things finally start to solidify. The final cast list is different than the initial cast list, some people determine the time commitment is too much, or there are schedule conflicts, or don’t think the part is quite right. So the Director has to rework the parts sometimes announcing changes on the fly at the early rehearsals. 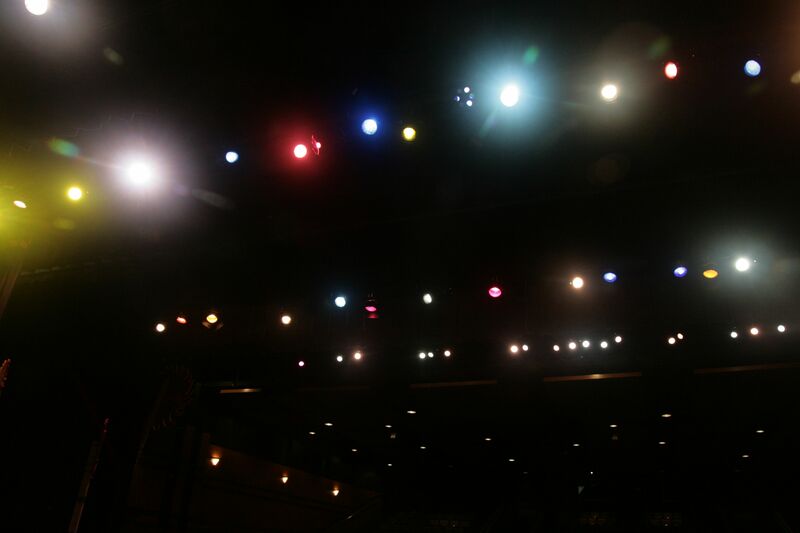 The cast in the MIddle School auditorium. 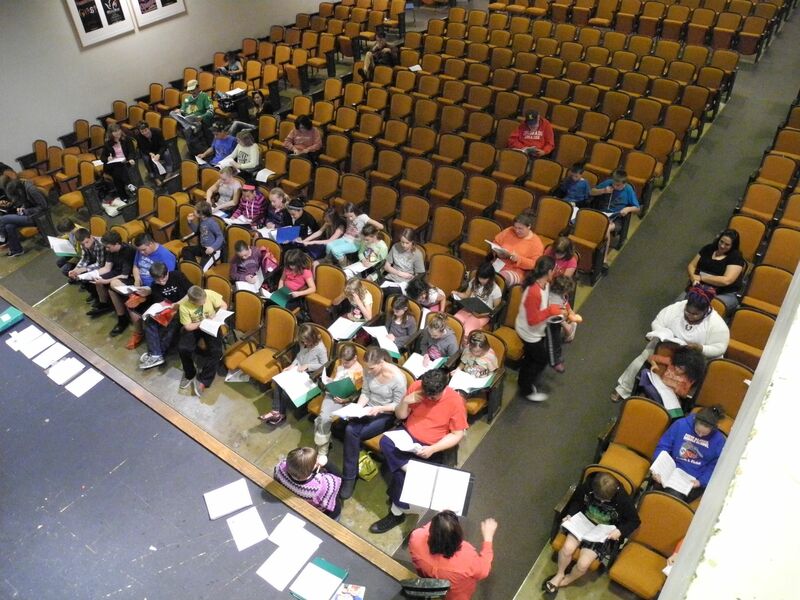 Since the first few weeks of rehearsal also overlap the last few weeks of school, many of the cast members have conflicts due to things like school concerts and awards nights and sports events. 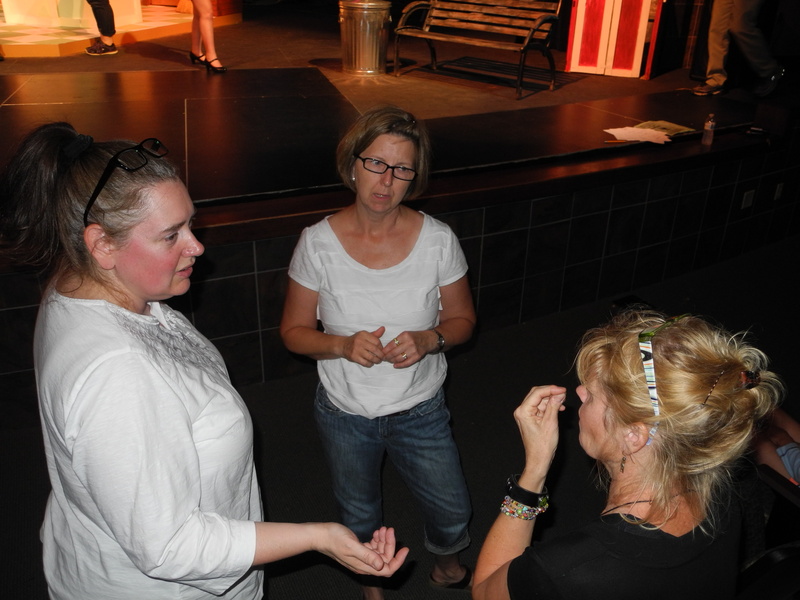 The Director and the Music Director work with whoever shows up to make the most of the two hour rehearsal time. 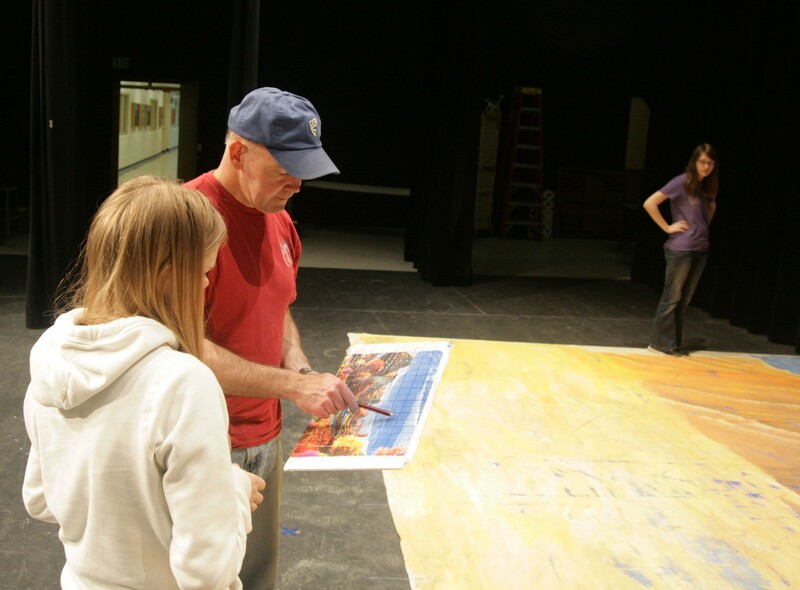 Set Designers Yvonne, Scott, and Monica plan out the backdrop. 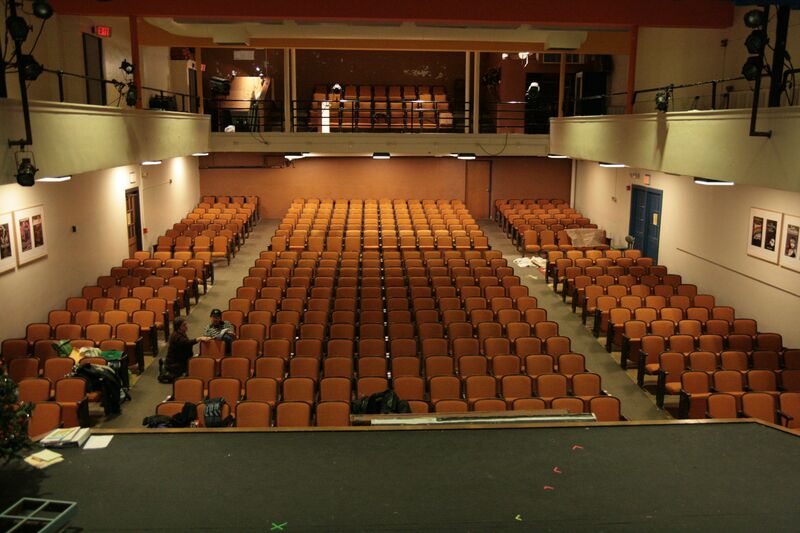 As of now though, school is over and starting tomorrow the cast will start rehearsing in the High School Performing Arts Center. 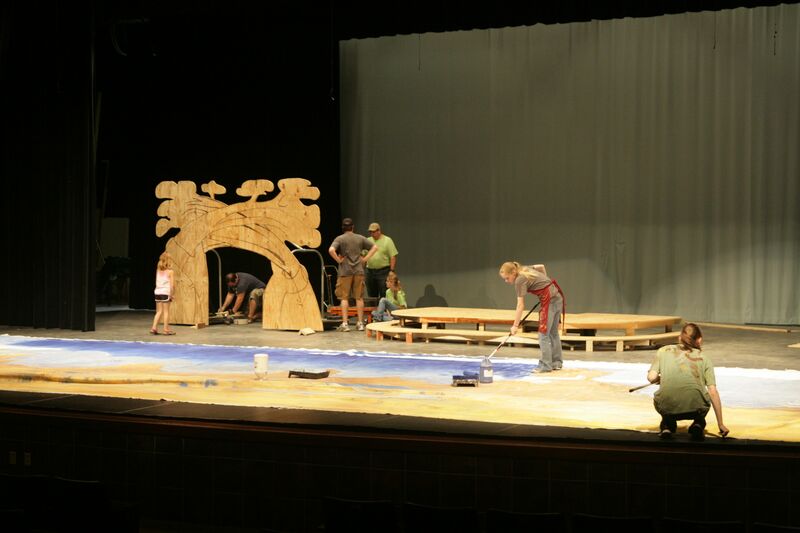 Some may be surprised that while they have been singing at the Middle School, the set building team, including many of the actors, have been busy working on set pieces. The construction of the main two level platform was finished and set into its approximate position, Horton’s nest was cut out and attached to a wagon, the jungle trees were put together and a hidden jungle gym was constructed. Monica and Yvonne worked to get the top half of the back drop painted so it could be hung. The wild ride to opening night will begin in earnest starting tomorrow as everyone’s attention will focus on the show. 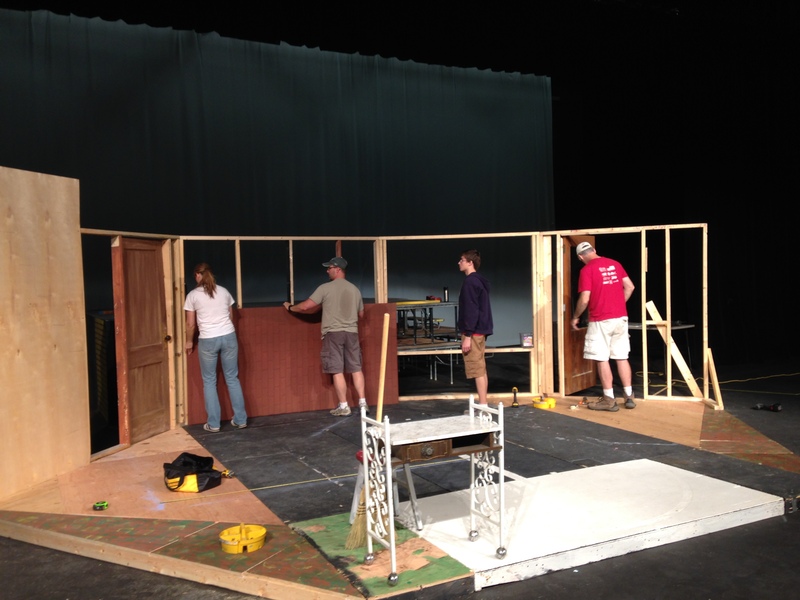 Set crew building and painting.